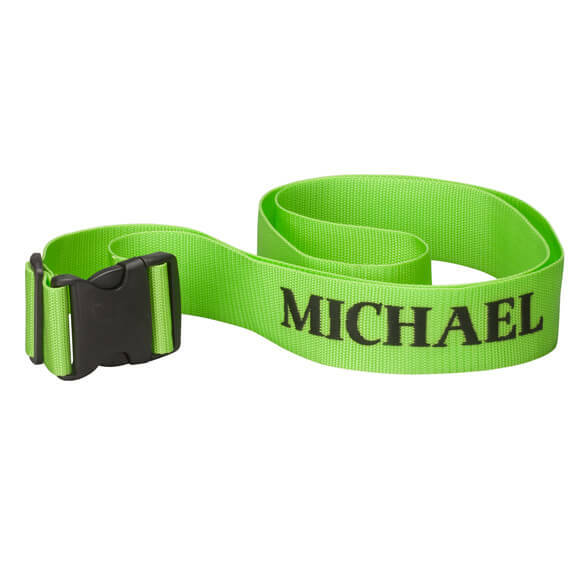 This personalized green luggage strap means no more guessing at the luggage carousel! Durable 2"W luggage strap prevents accidental openings with sturdy plastic brake clip to hold it in place. We’ll personalize. Specify name; limit 1 line, 12 letters/spaces. Polypropylene. Adjusts from 35" to 64"L.
I had 3 initials inscribed plus several blank spaces followed by a repeat of the initials followed by several blank spaces and then a repeat of the initials again. When the item arrived (a very eye-catching colorful green), the 3 sets of initials had only one one blank space to separate each set. If I had known this, I would not have requested multiple sets of initials. Other than that, strap should work fine. My spouse lies the idea of having these on our bags for easy ID. "WANT TO GRAB & GO WITH YOUR LUGGAGE, WATCH IT COME TO YOU WITH YOUR OWN NAME ON IT." I have these and my son and daughter-in-law liked them when we traveled to Italy. Decided to get them a set. My checked bag is black, this will help me ID my bag. Easier to identify your luggage. Because of the number of characters permitted when personalizing, the selections of colors, and the pricing.